I know many of you get the Wall Street Journal delivered to your doorstep but for the one or two who do not, today’s is remarkable. 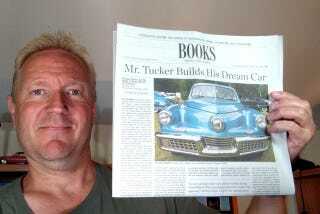 It has a huge review of my Preston Tucker book. The WSJ folks were kind enough to review my Chrysler Turbine Car book too, back in the day. I personally think the reviewer missed some of the nuance of my finer arguments in Tucker but the gist of it is this: My book occupies about 3 yards of page space in a national newspaper. Who cares what it says!? Here’s a link to the article which may or may not be behind a paywall. And a link to the book on Amazon. The article has given it a slight bump in sales. Steve Lehto has been practicing law for 24 years, almost exclusively in consumer protection and Michigan lemon law. He wrote The Lemon Law Bible and Chrysler’s Turbine Car: The Rise and Fall of Detroit’s Coolest Creation. This website may supply general information about the law but it is for informational purposes only. This does not create an attorney-client relationship and is not meant to constitute legal advice, so the good news is we’re not billing you by the hour for reading this. The bad news is that you shouldn’t act upon any of the information without consulting a qualified professional attorney who will, probably, bill you by the hour.